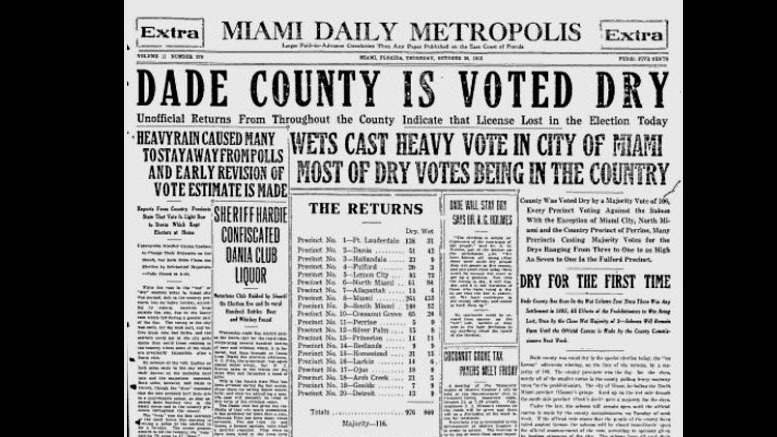 On a rainy October day in 1913, the ongoing battle between those who supported the sale and consumption of alcohol, and those who opposed it, was decided by Dade County voters. While voter participation was modest and the margin of victory was narrow, it was decisive. Dade County was voted “dry”. 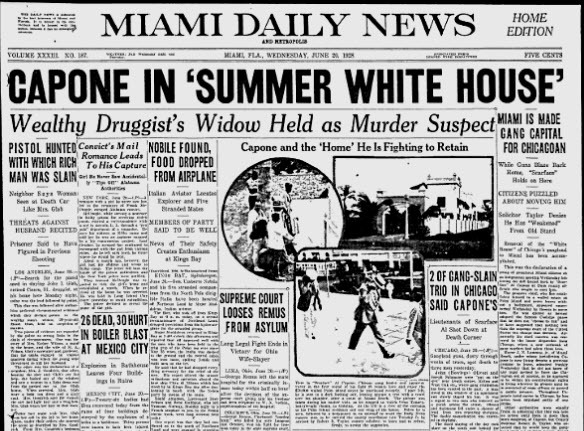 While there would be several appeals to challenge the vote of 1913, Dade County remained “dry” for the next seven years until the Eighteenth Amendment, also known as the Volstead Act, began the era of prohibition. The country, and subsequently Dade County, would remain dry until the ratification of the Twenty First Amendment on December 5th, 1933. Dade County was formed in 1836 and named for Major Francis Dade. Dade was killed in an ambush by Seminole Indians while leading a troop of 110 men from Fort Brooke (present-day Tampa), to Fort King (present-day Ocala), on December 28th in 1835. The ambush began the Second Seminole War, and led to the name of the newly formed county in his memory. Dade County stretched from Indian Key to the Jupiter Inlet. 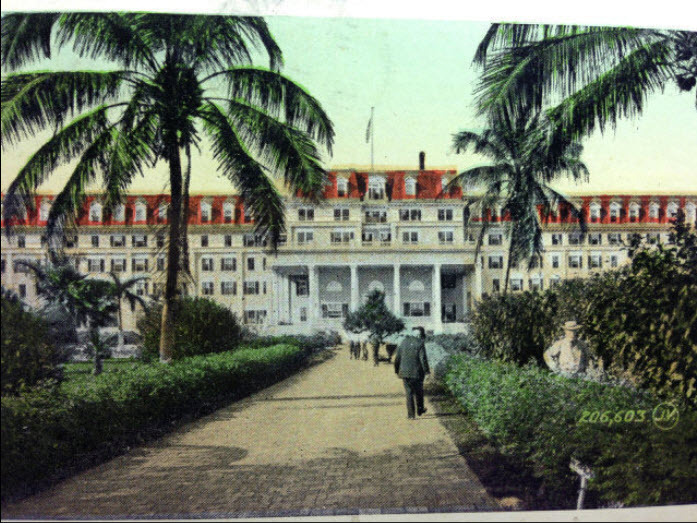 Palm Beach County was formed in 1909 and carved out of part of Dade County. By 1913, Dade County consisted partly of what would later be Broward County (formed in 1915), and its present-day configuration. Given that most of the northern portion of Dade County was rural, what would become Broward County consisted of those supportive of the county becoming dry. The City of Miami was divided between those that supported the county remaining wet, and those adamant that the county should become dry. The “drys” consisted of women and religious leaders that aligned themselves with local chapters of organizations like the Anti-Saloon League (ASL). The “wets” were supported by breweries, distillers and saloon owners that had a vested in the trade. Other “wet” supporters were those who believed that consuming alcohol was an American right. During the early part of the Twentieth Century, local municipalities held referendums to allow citizens to determine the fate of the legality of alcohol consumption. 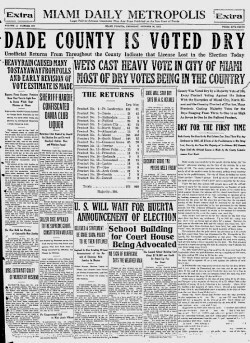 Miami held two prior votes in 1907 and 1909 on whether to remain “wet” or become “dry”. The “wets” narrowly won both votes. In the first election, keeping the county “wet” passed by only a twenty-vote majority. By the time the vote in 1913 approached, the fight would be rigorous between the two factions. Both sides had powerful allies, but the “drys” were gathering more formidable support by the early nineteen teens. The “drys” got support from a powerful Florida State Senator, Frederick Mitchell Hudson. Hudson was the president of the Florida Senate and representative for Florida’s Thirteenth District. 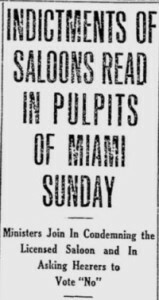 In addition, S. Bobo Dean, editor of The Miami Daily Metropolis, was a member of the Anti-Saloon League. The Daily Metropolis ran a large ad on October 24th describing the arrests associated with alcohol consumption. The ad stated that “Out of 14,000 Inhabitants, There were 2,638 Arrests during the Past Twelve Months. One Arrest for Every Five Inhabitants”. This statement was to demonstrate the impact of alcohol consumption on the Miami community. Dean wanted to sway the Miami vote to make Dade County “dry”. In addition, a front page article in the Daily Metropolis on Monday, October 27th, which reported that a number of Dade County ministers read an indictment of alcohol consumption based on both moral and monetary appeals. The Sunday sermon prior to the October 30th vote was dominated by the importance of the upcoming vote. They urged their congregation to vote against Dade remaining a “wet” county. On October 30th, enduring torrential rain, one thousand eight hundred forty one Dade County voters cast their votes. Many believed the weather kept the turn out for the vote smaller than expected. Once the votes were tallied, the victors won by only 116 votes and Dade County had officially been voted “dry”. The folks from Miami were shocked at the results. It is ironic that rain was partly responsible for Dade County going from “wet” to “dry”. The “wets” would make multiple attempts to overturn the vote, but had no success. One attempt claimed that Broward County had already been created as a county in 1913 and that the votes from the northern, rural part of Dade County should not have counted. However, the courts did not buy the argument. The vote partially was responsible for both sides supporting a new county in the northern portion of Dade County. Broward County was officially born out of land from the northern portion of Dade and the southern portion of Palm Beach counties in 1915. Had this happened prior to the vote of October 1913, Dade County may have remained a wet county until the ratification of the Eighteenth Amendment. On December 10th, 1913, just a couple of months after the Miami vote to go dry, the Eighteenth Amendment was introduced in both houses of Congress. By the end of 1917, it passed both houses. By January of 1919 the amendment was ratified by Nebraska, which was the thirty-sixth state to ratify the amendment. Following a veto by President Woodrow Wilson, legislators successfully voted to override the president’s veto. The National Prohibition Enforcement Act, also known as the Volstead Act, became law on January 17th, 1920. The original bill was sponsored by Minnesota Senator Andrew Volstead. The law prohibited the manufacture, sale and transportation of alcoholic beverages in the United States. 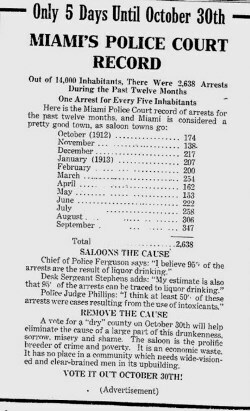 Ultimately, the biggest impact of Dade County’s vote in October of 1913 was providing Miami time to perfect the clandestine distribution and consumption of alcohol in the region. Miami and South Florida would become a big player in the bootlegging of alcohol from nearby locales that were not limited by the Volstead Act. The close proximity to the Bahamas would make South East Florida a major player in the import and distribution of alcohol during prohibition. Miami Metropolis: “Indictments of Saloons Read in Pulpits of Miami Sunday”, October 27th, 1913. 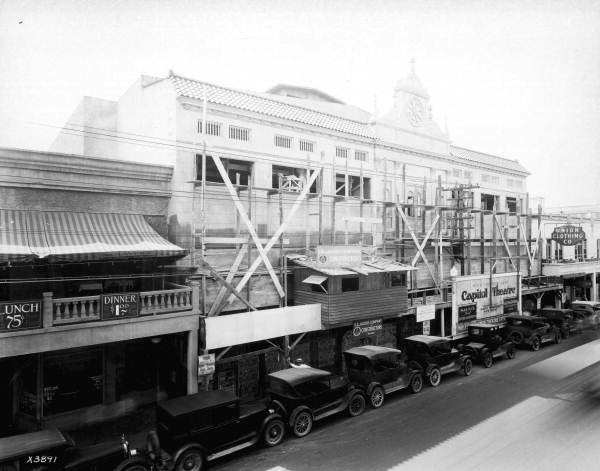 1 Comment on "Dade County Voted Dry in 1913"
B F Lasseter owner of the Majestic saloon tried to have vote of Oct 1913 over turned . His case went all the way to the Florida Supreme Court and his case was defeated.